Combine all the spices, sugar and salt with the coconut milk in a bowl and stir well to dissolve the sugar. Put half of the marinade in another bowl and using a pair of disposable gloves (as the turmeric will stain your hands yellow) – mix the marinade with the chicken pieces, while mixing the beef cubes in the first bowl. Cover both bowls with cling wrap and leave in fridge for at least 6 hours, preferable overnight. The longer the marinade time, the more the flavours will infuse the meat. Soak sufficient bamboo skewers (calculate 3 – 4 pieces of meat on each skewer) in cold water for a few hours, then remove and pat dry with a towel. Thread skewers with meat and leave at least half the skewer uncovered, for grilling. BASTING OIL: Combine in a bowl the peanut oil, soy sauce and honey and mix well. Place skewers over hot coals or in a preheated grill until well done. Keep basting with the basting oil, using the lemongrass stalk ‘brush’ while turning the skewers to brown the meat to a crisp on the outside. Be mindful that chicken cooks faster and usually takes about 5 – 7 minutes on hot coals; beef would take at least 10 – 12 minutes. 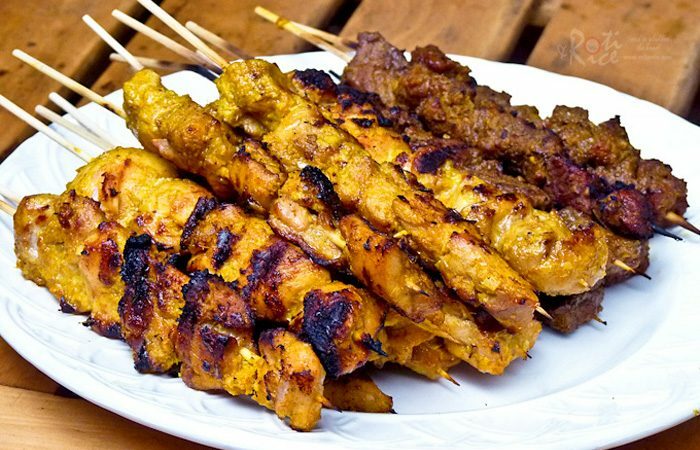 To check ‘doneness’, pull out a piece of chicken/beef from the skewer with a fork. If it comes apart easily, with all the inside, all is cooked and is done. Heat the peanut oil in a saucepan until smoking, then pour in the ground spice mixture. Simmer on medium heat for 7 – 10 minutes, stirring occasionally to prevent sticking. The mixture should now be aromatic and fragrant – now add the tamarind paste, with sugar and salt to taste. Bring to boil and then add the coconut milk. Simmer on low heat for another 7 – 10 minutes and test taste: sauce should be spicy, tangy, salt-sweet and mildly sour. Lastly, add the ground peanuts and mix well. Leave in pan for a few minutes, then remove from heat. As the Kajang satay sauce is known to be very thick in consistency, you may add more ground peanuts until it is only slightly runny. This allows more sauce to stick to the meat when the skewers are dipped into the sauce bowl. Serve the satay skewers with fresh cucumber wedges, red onion and pieces of “NASI HEMPIT”.